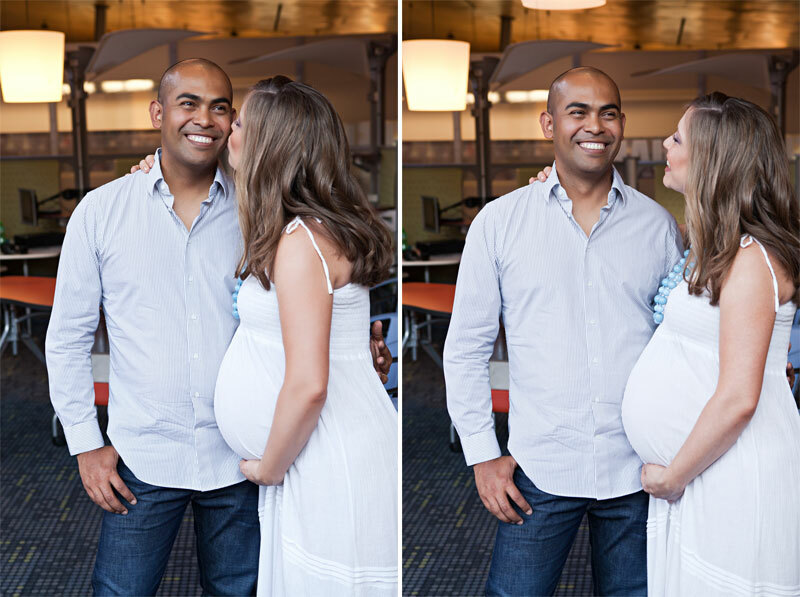 What could possibly be more exciting than expecting your first child? If you ask Kim and Jose that question right now, they will likely tell you: Nothing. Nothing is more exciting than that! You see, these two are expecting their first little one, a girl, next month, and they’re as happy as can be. When Kim first contacted me (Kelley) about setting up a maternity session, I could feel their excitement, and that was through an email! Not only was Kim super excited, but she was extremely organized and thorough when it came to planning her session. After contacting Josh and me about setting up a shoot, she sent me another email that contained three location choices, website links and photos for each location, and photos of her and her husband so that we could see what they look like! I’ll tell you what, THAT is my kind of email! With all of that organization and planning loveliness, I knew right away that Kim and I were going to get along just fine. As soon as Josh and I saw the images for this library location, we jumped on it! Kim and Jose added it to their location list because they fell in love with its interesting architecture, and who can blame them? This place is amazing! Now, if you’re not aware, it is usually the case that photographers (especially those with flashes and a few not so inconspicuous lenses) and public places do not usually mix well. Knowing this, Kim (being her ever-so-wonderful organized self) called ahead to make sure we would be permitted to take photos inside the library. To our surprise, they were completely fine with the idea! Josh and I were so surprised by this, that we showed up to the location extra early just to double check on the whole shooting a giant camera in-doors thing. Not only were they okay with it, they LOVED the idea and were genuinely excited about it! The four of us were excited about it as well, and for two main reasons: Awesome photos AND air conditioning! That’s pretty much hitting the mother-load when you’re doing a July photo session in Phoenix, AZ with a mother-to-be. Kim and Jose, you guys are absolutely amazing, and with so many things working out perfectly in our favor, Josh and I are pretty sure that this maternity session was simply meant to be. We had a blast quietly sneaking around the library with you, and we can’t wait until August when we get to meet your sweet little girl, and maybe read her a book or two. 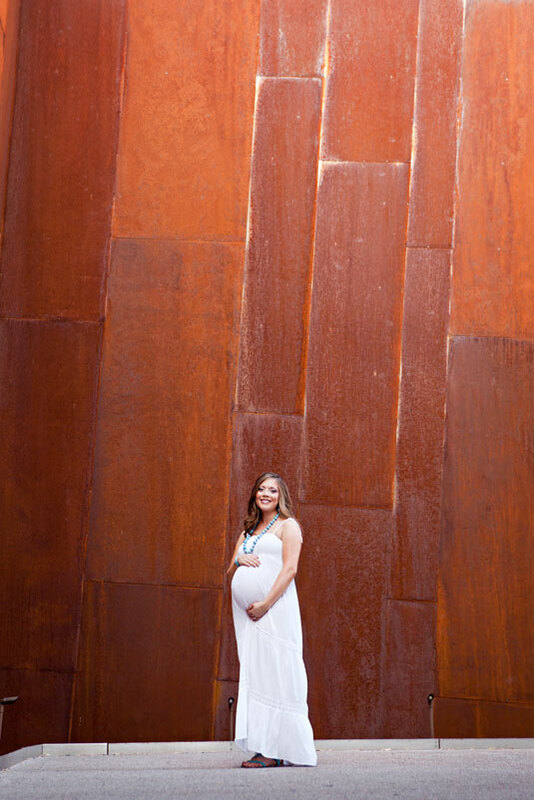 Click to see the rest of the photos from Kim’s Exciting and Ever So Organized Maternity Session. If I had to choose, I’d have to say that my favorite thing about Amanda and Javier’s wedding was that they made it their own. Sure, they had some typical traditional stuff in there, but it was mixed in with just the perfect amount of personal flair to make it classy, yet fun and unique. In fact, I’ll call all the details in this wedding that show off their unique style, “Amandiers”! The traditional part consisted of having the wedding in a BEEEAUTIFUL location at the Pointe Hilton Tapatio Cliffs Resort! The only thing that ALMOST ruined it was the dust storm that tore through right after the ceremony (narrow miss… phew!). The location was a stunning venue with equally magnificent views to go along with it (when it wasn’t covered with dust that is!). As far as the unique parts (Amandiers) in this wedding go… let’s start with the groomsmen’s shoes! Javier comes from a wrestling sort of lifestyle. He lives and breathes it in fact. And his shoe choice for the guys made that plain and clear! Definitely some of the most unique man shoes we’ve seen at a wedding yet, I loved it! Not to be outdone, the girls put their own spin on their bridesmaid gear by throwing in a little parasol action to brighten up the photos. Love! (Amanda and Javier also handed out parasols and sunglasses to the guests to protect them from the burning AZ sun during the ceremony! Another of my favorite Amandiers was a photo idea that Amanda emailed me about weeks before the wedding so I could plan it into our photo time and that was this bar photo with all the girls taking shots! What better way to showcase you hanging out with all your friends on your wedding day than to show you living life and having fun together?! Some of the Amandiers were incredibly sweet and sentimental. For example, the activity left on the guests tables was a great idea! Each table number represented a year in the couple’s marriage and each guest at the table was to fill out a letter that the couple would read on the anniversary year that corresponded to their table number! So on Amanda and Javier’s 5th anniversary they would read all the letters written by table 5! Such a great idea and I’m jealous that I’m not reading letters every year from my own wedding guests! On top of the table activity, the guests had another fun thing to play with and that was the Wedding Snap app. Have you seen this? Basically, instead of having little disposable cameras at every table, there’s a card with instructions to download an app so that all the wedding pics you take on your smart phone, can be added to the app so the couple can have them all. So genius! This little clever wedding day find was courtesy of Shannon Smith with Sassy Soirees Wedding and Event Planning. Shannon was the mastermind that brought all these little Amandiers together into one smoothly running wedding day. She did such a great job enacting the couple’s vision while adding in her own expertise and ideas (like the app). Shannon, you’re a pro and I can’t believe how perfectly you coordinated this wedding while being six and a half months pregnant! SUCH talent… and stamina! And about the reception… oh the reception! Talk about an incredible party! Drinks were flowing, the band was rocking, the dance floor was full, and both the couple and their guests were having the time of their lives! And in typical Amandier style, the fun was mixed in perfectly with the sentimental. (I LOVE this photo of Amanda and her dad dancing while her mom and company are huddled together watching through tears!). (Another great daddy/daughter moment was when he looked high and low to find her after the ceremony so he could give her this hug). Midway through the reception, Amanda and Javier presented Amanda’s parents with a very special gift that had been planned long ago. In honor of her parent’s wedding anniversary, the bride and groom presented them with an exact replica of the top layer of their own wedding cake! It was such a special moment filled with tears and heart felt speeches. After that perfect moment, the dancing resumed and the joyful celebration continued on and on as the couple’s happiness grew with every moment that passed. What an amazing day! Amanda and Javier… what a WONDERFUL wedding you had! We had so much fun and were incredibly happy to get to be a part of it all! Congratulations and may your celebrations together always be as happy as this one was! Click to see the rest of the photos from Amanda and Javier’s joyful wedding. Emotions were running high on the morning of Marah and Shawn’s big day! In fact, I’m pretty sure they were feeling the pressure of the words “big day”! Marah was dancing around, practically stomping her feet in anticipation as she sat getting her hair and makeup done, before putting on her UNBELIEVABLE dress that I (Breanna) fell in love with immediately! (TING Makeup and Hair did all the hair for Marah and the bridal party, check her out!). Marah and Shawn had their ceremony at the gorgeous Wayfarers Chapel in Rancho Palos Verdes, CA. With it’s beautiful architecture and surroundings, the Wayfarers Chapel was the perfect representation of the beauty found in Marah and Shawn’s relationship and it proved to be the perfect place for them to profess their love in front of all their friends and family that day. After the ceremony, the newly married couple traded their nerves for joy as they headed over with all their friends and family to the Trump National Golf Club to dance the night away at their stunningly beautiful reception! I think I literally lost my breath when I walked into that ballroom! The deep reds and golds combined with the perfect amount of flowers and lighting, created an absolutely killer ambiance that could be rivaled by only that of the ceremony earlier that day! Since you’ve now seen her breathtaking handiwork, it seems like an appropriate time to introduce Melissa Veenstra from Let’s Do This!, who was the talented hands that brought all the pieces of this elegant puzzle together. You may remember Melissa from her own wedding that we photographed a few months back! Well she got married and then went quickly back to work to begin investing her heart and energy into making Marah and Shawn’s day as special as her own had been… with many of the same vendors involved as well! I have to say, it was fun to be back together with the old team again! Mainly, with Hoo Films, since we couldn’t have picked a better partner in camera crime for Marah and Shawn’s wedding day! Shannon Avery and her team do incredibly moving work, as they demonstrated at the reception that night while presenting Marah and Shawn’s wonderful love story video that had me scrambling to wipe tears off my camera as I watched it! I wasn’t the only one with a tear problem, Marah and Shawn’s entire day was filled with all kinds of emotions and special family traditions that left us all in need of more tissues than a huge place like the Trump could even hold! Marah and Shawn are both of Filipino heritage so they found many touching ways to incorporate their cultural and family heritage into their wedding. During the ceremony, they were given Filipino coins that were borrowed from Marah’s aunt, as a symbol of the wealth that is wished upon them. They also borrowed Marah’s mom’s covering and rope to place over them during a special part of the ceremony to symbolize their new found unity as a married couple. And Shawn used his father’s wedding ring as a way to show honor to his father. But by far, my favorite personal tradition they held up was having the guests actually pin their money onto the couple during the dollar dance! Each time someone came up to pay for a dance, they found a new and creative way to attach the cash to the couple! It was so awesome and made for some great photos! The dollar dance was only a small part of the fun that was had at this party! Everyone was so happy to see Marah and Shawn married, that they laughed, danced and celebrated themselves right into the morning! Unfortunately for Marah and Shawn, they had an appointment the next day… with us… for more pictures! Luckily the excitement for their photos easily over ruled their tired bodies from the night before, so Marah put on her reception dress and Shawn laced up his fancy shoes and they headed over to meet us and begin the final aspect of their wedding… the much anticipated Unique Session! The Unique Session is a photo session after the wedding that gives the bride a chance to wear her dress again and it gives us a chance to be in control of the timing, lighting, etc., etc. to free us up get the very best photos possible! It also enables the couple to have wedding photos taken at a variety of locations so they can squeeze in all the different looks they wish they had time to get on their wedding day! Scottie and I (Breanna) had spent much of the afternoon driving all up and down the coast of Rancho Palos Verdes, since exploring beautiful places is one of the perks of the job for us! And we found some photo locations that fit the beauty of Marah and Shawn’s wedding perfectly! The only thing we didn’t find were easily accessible sandy beaches, but Marah found a way to get her dress wet regardless! We were all muttering silent prayers that the waves wouldn’t whisk her away as she clung tightly to the rocks as the powerful waves washed over her. Of course Shawn was standing by ready to swim out and rescue his bride if need be! Fortunately, Marah’s grip is as strong as her determination for good pictures, and a life guard rescue by her heroic husband was not necessary. Though the risk was well worth it because we all had a lot of fun and got some wonderful pictures out of the entire experience! Thanks Marah and Shawn for being such wonderful people! You were both so incredibly kind to us and a breeze to work with. Both Scottie and I found ourselves super excited about your wedding, not just because we knew it would be fun, but because we couldn’t wait to see the two of you again! You are both amazing people and we’re so happy you found each other to enjoy life together with. Congratulations and we hope to see you again soon! Click to see the rest of Marah and Shawn’s Wedding and Unique Session photos! This wedding is celebrating one of the best parts about a wedding… STYLE! Just from taking a glance at this wedding you might think, hmm, someone here definitely knows what they’re doing! And you would be correct! Lesley is an interior designer and her mad skillz definitely found a way to showcase themselves on the wedding day! For starters, Lesley and Mike chose the perfect venue to fit their style… The Clayton on the Park. It’s one of our favorite venues to shoot at because it provides such an incredible white canvas that allows any special touches the couple add in to really pop! Plus the lighting there is BEEEAUTIFUL! It’s a photographer’s dream! Lesley and Mike chose to live up this feature by highlighting bling against the modern white backdrop. That’s right, shine, shiny, and the shiniest, that was the look for this wedding. And if you’ve been following Radiant for very long, you’ll know that means that I (Breanna) am in heaven! The shinier the better has been my motto since I was a kid! Yes, there was a lot of feminine bling, but there was definitely some man style in the room as well! Mike added in his own special touch of Converse All Stars (complete with the wedding date), his presidential seal cuff links which highlighted his monogrammed cuff, and his best man even gave him hand made friendship bracelets to wear on the big day! Not to mention, Lesley had a piece of her dad’s tie sewn into the inside of her wedding dress (left picture below) which was a beautiful tribute to him. …and so many other little touches that I could go on all day! Besides providing a great blank slate for decor, the Clayton also gives you fantastic views through their floor to ceiling windows overlooking Scottsdale Civic Center’s beautiful green ambiance. Of course when selecting their venue, Lesley and Mike picked up on the fact that this is a perfect way to include a little nature into your summer in AZ wedding while keeping guests in the nice cool air conditioned room at the same time! The other Clayton feature that brings a smile to my face whenever I hear that one of our couple’s is getting married there, is their wonderful and talented coordinator who works there, Carrie Bayless. We’ve been working alongside Carrie for several years now as we’ve all grown and transitioned in our careers and every time we work with her, she seems to get better and better at what she does! If seeing the Clayton itself doesn’t sell you on having your wedding there, meeting Carrie will definitely do the trick, she’s incredible! Lesley’s designer’s eye also came into play when she was thinking about what might look good in her pictures. Remember, it’s summer in Arizona and 100 plus degrees, so we’re pretty limited in the amount of places we can go outside for photos! Fortunately Lesley was thinking ahead and she gave us some great ideas for spots to shoot around the Saguaro Hotel next door where the couple and their guests were staying. The colorful walls around there were such a fantastic contrast to the white walls of the Clayton that we got an entirely different look and we loved it! Thanks Lesley! And thanks to the bridal party who were willing to walk through the heat in between air conditioned rooms, we appreciate you following us around and not punching us in the faces for it- we know the heat can make a person a little crazed with anger! Thanks for keeping your cool guys, and for finding a way to smile in the midst of the sweat! (Like our page to tag yourself in some of the photos on Facebook!). Another person to thank who helped us set up shots, communicate with everyone, and organize people and details was the coordinator with Serendipity Cinematography We’ve worked with Serendipity before and each time we’ve been thrilled with how well they not only work with us, but help us do our job even better! It’s a fine dance between a photographer and videographer on the big day, and we want to personally thank Serendipity for always doing such an excellent job with that! As you can see, all the people involved came together as a team to pull off this beautiful wedding without a hitch! (I LOVE this shot of her emotional brother walking an emotional Lesley down the aisle!). Oh and the guests played their part by partying like it was 1999! The party was definitely rocking and Lesley and Mike seemed to enjoy every ounce of it! Thanks Lesley and Mike, for being so much fun to work with and for finding that perfect balance of casting your wonderfully creative vision to us while still trusting us to add our own creativity to the mix. We appreciate you putting your time into thinking about the photos as well as putting your trust into us to do our best on them… all of that worked out to help us capture the true beauty behind your relationship and your day. We hope you loved every second of it and that you love the photos just as much! Click to see the rest of Lesley and Mike’s stylish wedding photos here! Take a second to think back on the people who really helped shape your life. The ones who were there watching you grow up, make mistakes, shed tears, overcome obstacles, realize your potential, etc., etc. These photos here are all about those kinds of relationships. …is a sweet twenty something who wanted to make a difference in the lives of young girls. So she began volunteering as a mentor for girls at her church who were about to enter the eagerly anticipated (and also secretly dreaded) world of Junior High! They bonded that first year as the girls stepped into 7th grade facing school dances, making or not making the cheerleading squad, friend problems, figuring out which group they fit in with, and ultimately discovering who they really are. 8th grade came along and Chelsea decided to stay along side the girls and help them through their upcoming challenges that she knew through experience, would continue to come their way. That year she stood by helping them through more friend problems, moral dilemmas as they began defining and learning to live by their personal beliefs, saying good bye to good friends as they headed in different directions for high school, and preparing to become full fledged teenagers! Guess what? They SURVIVED Jr. High!!! Hooray! And off to High School they went! Chelsea decided to come along for that too! Of course the group members changed from time to time, but even with that, they remained very close as a whole. They had already spent two years together maturing into real live teenagers and now they were headed into four of the most life changing years… still together… still with Chelsea supporting them, guiding them, and comforting them all along the way. They made it through football games, drivers license testing, break ups, good grades and bad grades, senior year goodbye parties, more friend problems, more fun, more pain, more drama, more growth… more of life… together. Which brings us to now. Now they are graduating. Now they are all following the paths they’ve been discovering and working towards along the way. Now they are saying goodbye to one another. To their support, their comfort, and their friends. Their relationships with one another and with Chelsea will be changing as they head to different parts of the globe. So they are grieving those changes together, but who am I kidding? They live in the land of Facebook, emails, texting, Skype, etc. This isn’t goodbye! This is just a celebration of moving forward! Time for a last hurrah together with everyone in the same place at the same time! Of course we all know what that means…. They packed their bags, left the AZ desert and headed to California for a weekend full of Disneyland, the beach, van sing alongs, boy talk, and you guessed it… a photo session with Radiant Photography! I (Breanna) have to admit that I was so excited for the girls as they embarked on this memorable trip that I was actually a little jealous! I wanted to be a part of the fun and the memories, but I knew I was just going to be a third party observer. But before the photo session had even started, I realized that wasn’t going to be the case at all because they swept me up into the crazy fun and made me just as much of a part of it as if I’d been in the group all along! …I got to be right there having a ball with them through all of it! I’ve never been lucky enough to have a group like they’ve all had together, but while they were here I felt like a part of something I’d always wanted to have! So a special thanks to the girls for making me an honorary member, I LOVED it and you guys made my year!!!!! And a special note to Chelsea… Chelsea, you are incredible. I’ve been around you as you’ve poured more and more of your heart, time, energy, thoughts, etc, etc into these girls and I have to say that I think it was all worth it. You’ve been a huge part in helping these girls grow up into the amazing people they are now and I know they will remember your role in their growth for the rest of their lives. I’m so proud of you for the things you’ve sacrificed in your own life for the good of these girls and I’m sure they’ve thanked you for this from time to time and I want to do so myself as well. Thanks for being an incredible role model, not just to the girls themselves but to everyone who sees you with them. You truly are a great example of what it means to love and give of yourself to others. You’re a hero to more people than you know, Chelsea. We had so much fun capturing this incredible group of girls who we could easily see were super close and had been through so much together. They really love one another and we were so happy to get to be a part of this great group as they celebrated their time together, their friendships, and their upcoming new adventures. Cheers to all of you! Scottie and I have enjoyed getting to know all of you at different points through various things we’ve photographed that you’ve been a part of, and of course through this trip. We can’t wait to meet up with you in the future and see who you’ve all become and what’s going on in your lives! You’re moving forward into life with enthusiasm, and we couldn’t be more excited and happy for you all! Click to see the rest of the photos from this Farewell Session here.